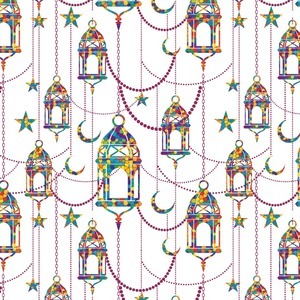 This is the perfect design for anyone who is into Moroccan, Arabesque or Bohemian style decor. We chose a white background to give it a fresh, clean, crisp feeling. Changing the background to black or navy blue gives it an exotic / romantic feel. The design consists of brightly colored mosaic style lanterns with stars and moons hanging like chandeliers from chains. You'll find all sorts of colors including blue, green, yellow, and purple. We chose not to personalize the main design, however the default layout has your personalization at the bottom. Go crazy in the design center! Change the background color, the font, and even the font color. Pick a beautiful monogram or write your name. Change a little or change it all. Whatever you do, make it yours! If you need any help with our design center just give us a call! We are always happy to help.